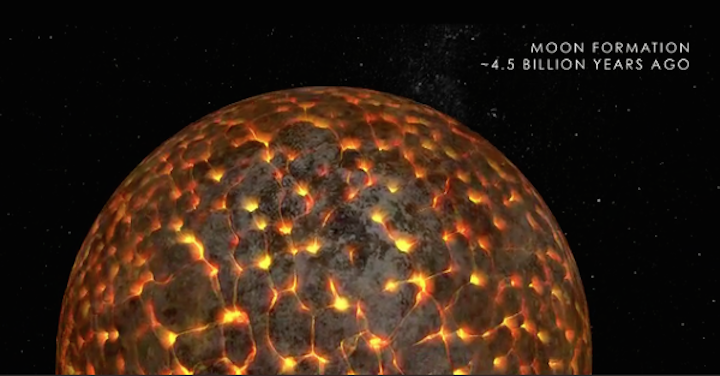 A water-free magma ocean would produce a very different Moon from Earth’s. Early in our Solar System's history, the Earth was slammed by a Mars-sized body. The collision effectively disassembled both bodies and created a swirling mass of debris from which the present Earth and its Moon condensed. The process of forming these two bodies was violent, as debris of various sizes rained down on their surfaces. As a result, the Moon's surface started out as a global ocean of molten rock. Eventually, as this ocean cooled, it formed the Moon's crust. But the process was complex. Different minerals solidified at different temperatures and depths. We've had some models of how this might have happened, based on a limited number of experiments, as well as our early understanding of the Moon's composition. But scientists from VU Amsterdam have revisited this issue in light of what we now know of the Moon. The scientists have tested how various mineral mixes behave under extreme temperatures and pressures. Their results indicate that the Moon must have started out with significant amounts of water mixed into its global magma ocean. How do you model an entire ocean of molten rock? You start with the known composition of the Moon and use that to create a mix of the appropriate minerals. Then you expose those minerals to extreme pressures and temperatures well beyond the melting point of rock. For these experiments, the temperatures ranged up to 1,550 degrees Celsius. Since the magma ocean was potentially hundreds of kilometers deep (current estimates range from 400 to 1,000 kilometers), pressures ranged up to 3 GigaPascals, which is nearly 30,000 atmospheres. While the researchers behind the work assumed that temperatures throughout the ocean were kept relatively even by convection, pressure varies with depth and helps set the temperature at which different minerals solidify. So the team tested various mineral mixes at a collection of temperatures and pressures to identify the temperature and depth at which various minerals would solidify. The results are exactly what you might expect: a series of concentric shells with different mineral compositions, in keeping with previous models that were based on a much more limited sampling of data. That's because of both the influence of pressure and because different minerals are more or less dense. Minerals may float or sink in the ocean once they start forming. But there was a bit of a problem: the crust that formed was nearly 70km thick. We recently sent the GRAIL mission to the Moon, which used a pair of orbiters to track subtle gravitational differences. GRAIL showed that the crust varies between 34 and 43km—only about half as thick. Fortunately, a second set of experiments helped sort the discrepancy out. The initial work was done after heating had been used to drive all the water off the minerals. This created a chemistry like we'd thought the Moon had immediately after the Apollo missions, which found the minerals there to be extremely dry. Since then, data has come in indicating that the Moon has significantly more water than we thought. So the authors did a second set of experiments in which the minerals were allowed to retain water before they were sealed up and melted. Studies attempting to recreate conditions on Earth had shown that the presence of water inhibited the solidification of one of the first minerals to form under dry conditions. And the authors find that the presence of some water—as little as 1.5 parts-per-thousand—were sufficient to completely change the crust thickness, dropping it to 42km, within the range of data. Adding even more water dropped the crust thickness even further. The authors find that several different conditions can produce the right thickness of crust: different amounts of water, different original depth of the magma ocean, and so on. But all of these conditions involve a significant amount of water in that magma ocean. All of which suggests that the violence of collision that formed the Earth-Moon system wasn't enough to drive all the water out of the debris.